First Hawaiian Center stands 429 feet and 30 stories high. 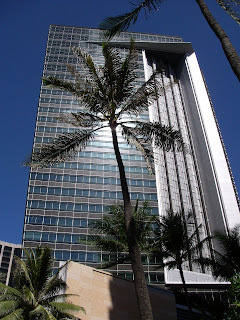 It is the corporate headquarters of Hawaii’s oldest and largest bank. It is located in Honolulu Hawaii. The postmodern skyscraper is unique in the way it and incorporates two separate styles of architecture on its opposite sides. The windows facing the ocean are horizontally louvered, and those facing the mountains are vertically proportioned, framing both views in their most flattering natural light. The building was designed by Kohn Pedersen Fox Associates and opened in 1996 after three years of construction. First Hawaiian Center’s height is especially significant because, prior to its construction, the city of Honolulu did not allow any towers over 350 feet tall. The city council raised the limit to 400 feet for this tower, and then compromised even further, allowing the extra 29 feet to accommodate this particular design. Click here to see the full list of the tallest building in each of the 50 United States. Really interesting sharing, recently I visited the first Hawaiian center during my hawaii tours . First Hawaiian Center was the busiest building in Honolulu. The 30 story structure rises more than 429 feet to claim the title of "Hawaii's tallest structure." Its modern design speaks tones to the culture of Hawaii, while paying homage to its future. It's definitely worth a trip if anyone wants to see the most stunning landmark in Hawaii.